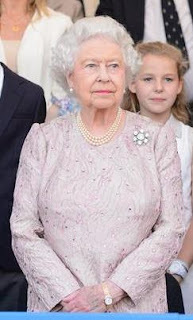 The Queen and members of the Royal Family toured a preview of the Coronation Festival, organized by the Royal Warrant Holders Association, in the grounds of Buckingham Palace. Click above to see video from ITN. Adorable, both in event (she posed with a bear, for heaven's sake, not to mention looked utterly delighted to receive a figure of Zara on her horse) and in brooch (the Nizam Rose, which seems to be in favor this year). Accompanied by members of the Royal Family, the Queen attended a gala evening at the Coronation Festival in the grounds of Buckingham Palace. And in the evening, a touch dressier, amping up the diamond volume with the massive Adelaide brooch (good one for such events, it seems - if you recall, she also wore this for her famous Bond girl appearance at the Olympics opening ceremony). 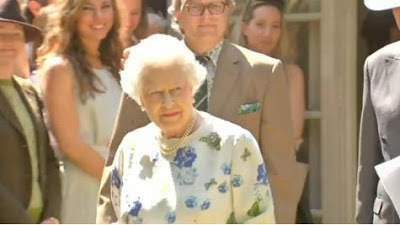 Click here for a look at other guests, including a rather spectacularly plumed Countess of Wessex.